Infrared view of the Cat's Paw Nebula (NGC 6334) taken by VISTA. NGC 6334 is a vast region of star formation about 5500 light-years from Earth in the constellation of Scorpius. The whole gas cloud is about 50 light-years across. NGC 6334 is one of the most active nurseries of young massive stars in our galaxy, some nearly ten times the mass of our Sun and most born in the last few million years. The images were taken through Y, J and Ks filters (shown as blue, green and red respectively) and the exposure time was five minutes per filter. The field of view is about one degree across. Full Story. Hiddenyoung stars in the Cat?s Paw Nebula are revealed in a spectacular new infraredimage taken of the nebular nursery, the birthplace of hundreds of massivestars. 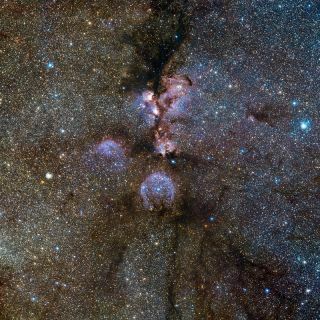 The stunning new photo from the European Southern Observatory (ESO) used infrared light to penetratethrough the glowing gas and dust clouds that normally obscure the view of theyoung stars. Theimage was taken by the Visible and Infrared Survey Telescope for Astronomy(VISTA) at the ParanalObservatory in Chile. TheCat?sPaw Nebula, NGC 6334, is located in the constellation of Scorpius (TheScorpion), towards the heart of the Milky Way, about 5,500 light-years fromEarth. Thenebula stretches across 50 light-years. In visible light, gas and dust areilluminated by hot young stars that create the strange reddish shapes that givethe object its nickname. This nebula is one of the most active nurseries ofmassive stars in our galaxy. VISTA,the latest addition to ESO?s Paranal Observatory in the Chilean Atacama Desert,is equipped with the largest infrared camera on any Earth-bound telescope. Itworks at infrared wavelengths that can see through much of the dust that cloudsthe Cat?s Paw Nebula, revealing objects that are hidden from the sight ofvisible light telescopes. Visiblelight tends to be scattered and absorbed by interstellar dust, but that dust isalmost transparent to infrared light. Someof the massive stars discovered in the Cat?s Paw Nebula are nearly ten timesthe mass of the sun. Infraredviews allow astronomers to learn more about how these stars form anddevelop in their first few million years of life. VISTA?s verywide field of view also allows the whole star-forming region to be imaged inone shot with greater clarity. Thisrecent VISTA image is filled with countless stars of our MilkyWay galaxy overlaid with spectacular tendrils of dark dust that are seenhere in full for the first time. Inmany of the dusty areas, such as those close to the center of the picture,features that appear orange are apparent ? evidence of otherwise hidden activeyoung stars and their accompanying jets. Furtherout, slightly older stars are laid bare to VISTA?s view, revealing theprocesses taking them from their first nuclear fusion along the unsteady pathof the first few million years of their lives. The VISTA telescope will now embark on several large surveys of the southern skythat will take a few years to complete.